If you were under the impression, or thought, that the apparent end of the world would be enough to stop The Avengers, then folks, you just having been paying enough attention. 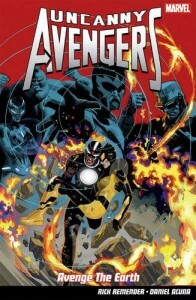 By now, you should know that in the Marvel Universe nothing is ever what it seems and even the destruction of Earth by the hand of the Celestial’s executioner isn’t enough to halt Thor, Havoc, Beast, Wasp and what’s left of the team from desperately trying to save the planet they call home. And as ‘Avenger the Earth’ begins that’s exactly what they’re doing. Well, not Thor, at least not in the beginning as he’s… uh uh no spoilers. Where was I? 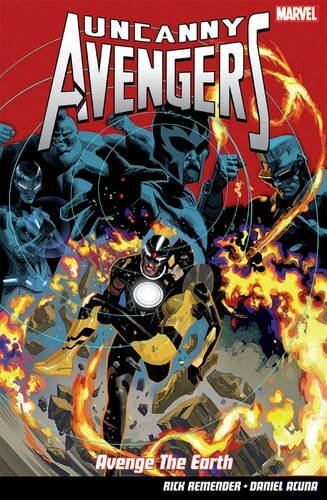 Oh yes, The Avengers, battling to save earth and everything they know and love. What’s that? Earth was blown to smithereens and as such, nothing or no-one can save it. Well, d’uh, this is The Avengers, and as everyone knows, The Avengers can do anything. Now shut up and pay attention. Following the cataclysmic events of ‘Ragnarok Now’, our trio of plucky adventurers now living on Planet X (the destination of the mutant migration and new home world of those who made the voyage) find they are alone and labelled terrorists as they fight against Eimin and her mutant council in an effort to restore everything they once knew. And their struggle isn’t going well, which is why they launch a last ditch attempt to break through the barriers holding them and their world in temporal stasis, reaching out through time and space for help. It’s a call that’s heard by the most unlikely of sources, an old trusted ally together with a onetime enemy an enemy arrive and offer a solution that’s as insane as it is daring, and left with little choice (via a particularly vicious form of coercion), Havoc agrees. Which is when all hell breaks loose, in a time travelling, action packed, nerve tingling, adrenaline pumping tale of sacrifice, redemption, betrayal, forgiveness and punishment in which each and every hero is faced with a simple, but crucial decision. Work together or perish and unite or die. It’s a lesson that everyone, with the fate and existence of Earth at stake, takes to heart as the heavens burn, Gods and demi-gods face each other among the stars and everything is changed forever.